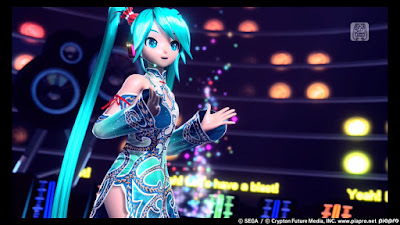 News by Britta S. , Lindsay M., and Matt S.
Good news for people who have Hatsune Miku: Future Tone and 220 songs is just not enough; now there's even more, with SEGA releasing the first DLC pack, containing extra costumes and music tracks. Meanwhile, the additional costumes have one particular stand-out: Miku's Emerald Chinese-style dress, which will forever be the best costume ever. This is the first of three DLC packs that SEGA will release for Future Tone. If you're keen to pay upfront, you can buy the season pass and get about $5 off the cost of buying each pack individually. Advent Dark Force has three separate story paths to take: the Goddess story, the Vile God story, and the Evil Goddess story. Each story has multiple endings, upping the content even further. The number three is the key here, as there are also three modes (easy, normal, hard). Your party can contain up to six members, and each can hold fully customizable weapons. A deluxe pack can also be purchased for $5.99 USD; it includes two digital art books (character collection and concept art), six mobile wallpapers, and five PC wallpapers. PM Studios and Acttil have announced a digital-only release this spring, in both North America and Europe, for Deemo: The Last Recital on PlayStation Vita. The game includes the original Deemo 2.0 story, voiced by Taketatsu Ayana with English subtitles, a new duel as well as duet mode both of which enable players to battle via ad-hoc, and a PS Vita exclusive “After Story” scenario. It’s important to note the way Sega will be releasing the game. Puyo Puyo Tetris will only receive a physical release on the PS4, with a price set at $29.99 USD. For the Switch the same price has been set for its digital version, whereas it will cost an extra $10 for a physical copy.